On New Year’s Day, my husband Britt and I drove our dogs out to San Francisco’s Ocean Beach. We parked next to a guy that was about to go surf the jumbly, stormy waves. Out of the back of his truck he pulled out an orange soft top board. Britt and I exchanged eye rolls. 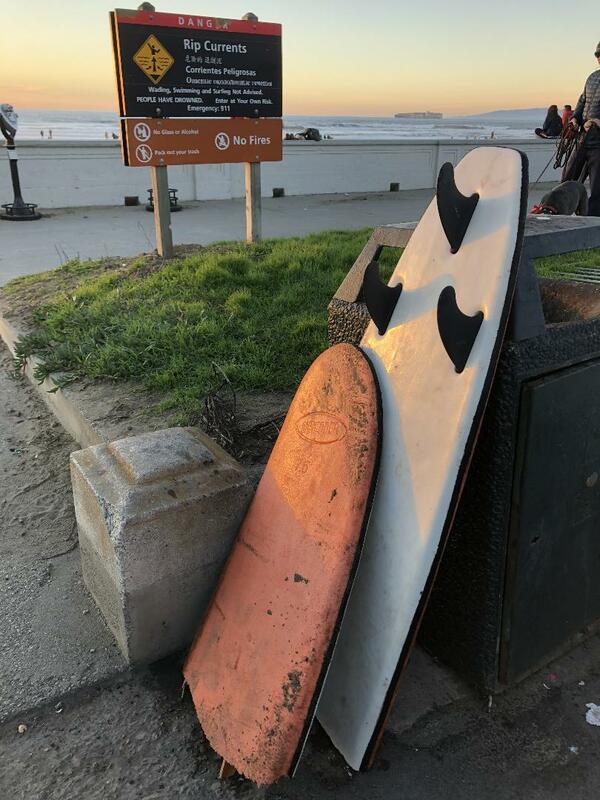 In the past year or two we had both noticed an increase in surfers thinking it’s cool and hilarious to surf foam boards in the heavy and dangerous waves of Ocean Beach. A month earlier, on a big day at Ocean Beach, a surfer’s body was seen by a bicyclist, floating in the white water. Rescuers were not able to resuscitate him. Two more surfers were rescued that same day, they both lived. I tried to remember ever hearing about three rescues taking place on the same day but I couldn’t remember that happening before. As someone who has spent almost thirty years trying to befriend Ocean Beach’s waves, the trend of taking out soft tops or going out when it’s 15 feet, no matter what your experience level is, drives me crazy. To be casual about surfing here is an insult to Mother Nature herself. It’s one of the most dangerous places in the world to surf. There are signs posted here saying, “People have drowned here. 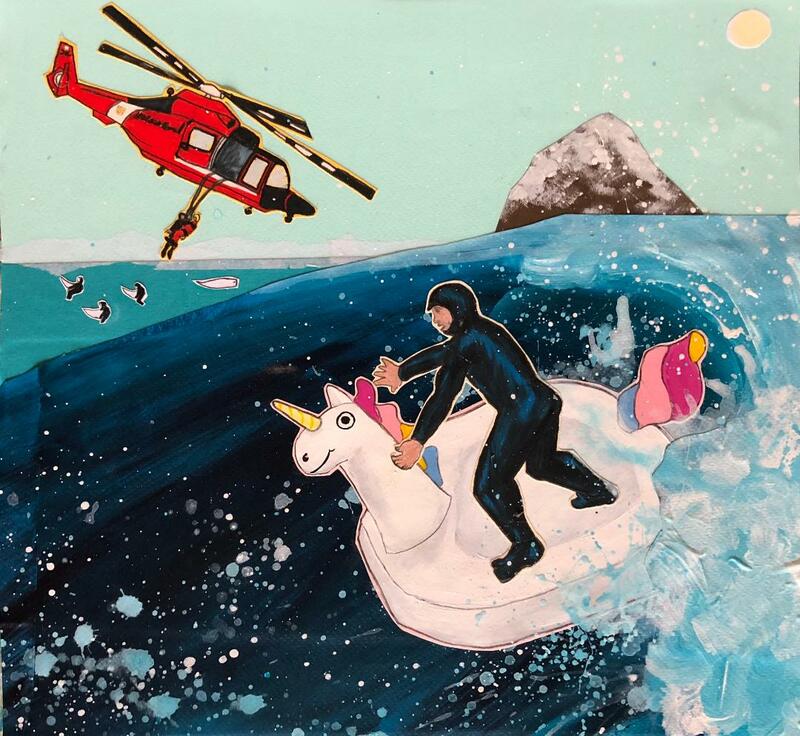 Call 911 for emergency.” Between the brutal paddle out, the endless current, the cold water, how far out it breaks and the shocking power the wave can assault you with, it’s taken me all my thirty years of experience to finally not physically shake with fear as I change into my wetsuit. I’m starting to think that a lot of people are adopting this casualness about surfing because they get insane wave riding footage delivered to their social media feeds all day long. Maybe some average surfers are becoming numb to just how experienced the surfers dropping into Mavericks or Teahupoo are. They start thinking that since everyone on Instagram and YouTube are surfing crazy waves, they can too. They watch Jaime O’Brien on YouTube paddling into 12 foot shore break on a hot pink soft top or dropping into Pipeline on a giant blow up pool toy and they think they too should be that hilarious at their local break. They might not realize though, that he was the youngest person to ever win Pipeline Masters at twenty years old. Let’s all google the video of Jaime O’Brien scoring a perfect ten at Volcom’s Pipe Pro and then try to explain how we are all just as qualified to take our soft tops out at Ocean Beach on a ten foot day or drop in at the Wedge on a blowup mattress with three of our friends. I’m all for pushing limits and having fun out there but it would be cool if everyone knew their own limits, not just the limits of the pro surfers in their phones. As for the guy we saw going out with just himself and his soft top on New Year’s Day? When we got back to the car the guy’s truck was gone but leaning up against the trash can, next to the sign about how people actually die at this beach, was his orange foam board, snapped in half.